Display locations and give driving directions to your customers. 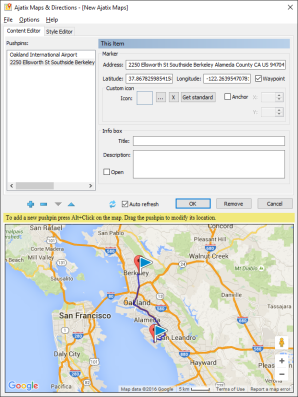 The Maps & Directions Dreamweaver extension will let you place an interactive map on your webpages. Let your customers see where your offices are located and how to get there. Mark locations of anything related to your business: branches, retail stores, real estate for sale, places of interest, events, etc. 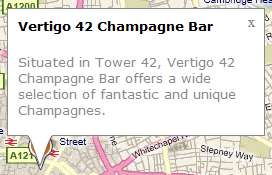 A live design-time preview displays the map exactly the way it will look like on your site and allows to enter locations simply by clicking on the map. Universal & Powerful - Maps & Directions is powered by and supports both world's leading mapping platforms: Google Maps and Microsoft's Bing Maps. Flexible styling options - use the built-in Style Editor to stylize the map and to select options best meeting your needs. 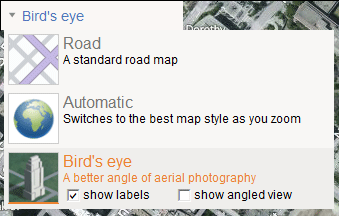 Different map types - select between Road, Aerial, Birdseye, and Auto map types for your default map mode. Dashboard - let your site visitors zoom in and out, pan and rotate the map with the dashboard controls. 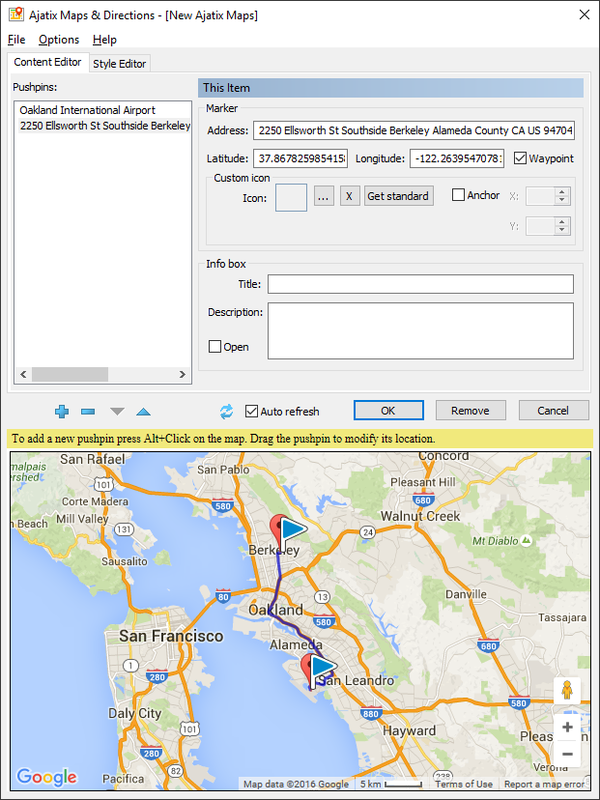 Map Type Selector - allow your customers switch between the map types. 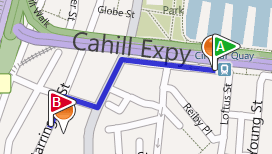 Scale bar - scale element helps to estimate distances on the map. Info boxes - display information related to locations in info box balloons. Routes and directions - show routes and driving directions. Select between different travel modes (driving, walking, transit), optimize by time or distance, set color and distance units. 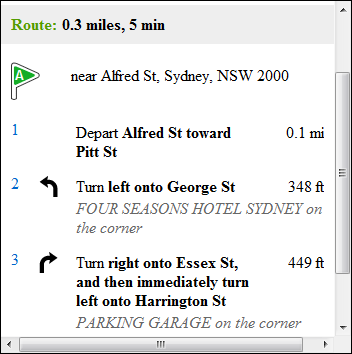 Turn by turn - detailed turn by turn directions can be displayed to make getting there even easier. Site visitor's directions - let customers get directions for getting there from their own locations. Keyboard support - keyboard shortcuts can be used to navigate the map. Full cross-browser compatibility - works in all currently used browsers (such as Chrome, Firefox, Edge, IE8 - IE11, Safari, Opera, etc. ), degrades gracefully in very old browsers. Valid HTML and CSS - Maps & Directions markup complies with HTML, XHTML and CSS standards and passes W3C and Dreamweaver validity checks. No frameworks required - no third party frameworks are required, the code is light, fast and easy to maintain. No Flash, Java or canvas is required. User-friendly Dreamweaver extension GUI - GUI is there for you to make setting up the map as easy as it can be. If you need to change a color, you change a color, not a hex value in a CSS file. All settings are organized, grouped, and labeled. Live WYSIWYG preview - see how your map looks and behaves in a browser, as you edit it. Any change in the style or structure will be instantly reflected in IE browser embedded into this window. No monthly fee or subscription - you don't have to pay monthly fee or subscription fee. Dedicated support team - our support team is more than happy to assist you in setting up your map. Free trial - no need to buy a pig in a poke, take advantage of a risk-free fully functional 15-day trial before handing over your money. 60 day money back guarantee - If our product does not suit you, we will return your money, no questions asked.